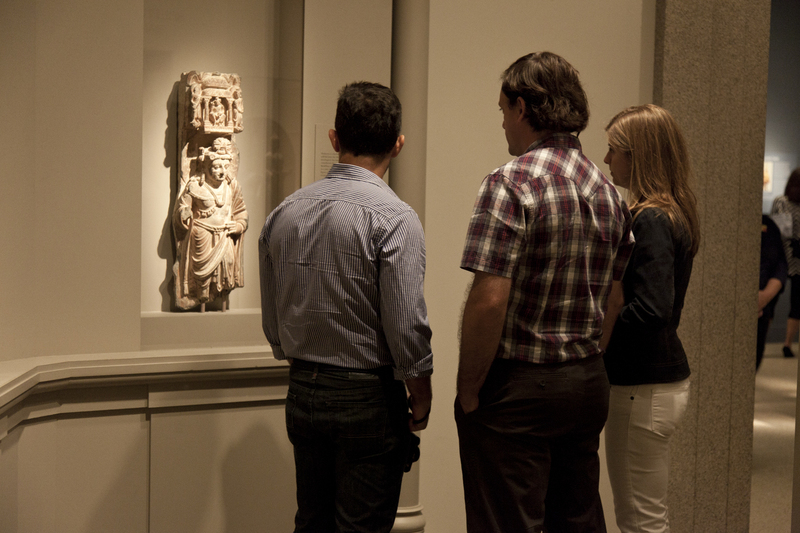 Visitors take a good look at a work of art at Freer|Sackler (photo by Cory Grace). Hillary Rothberg is an educator at Freer|Sackler. The above quote is this year’s motto for Slow Art Day—and how true it is. While we may all look at an object together, what we see as individuals varies widely. And it is that subjectivity that makes art such a powerful tool. Some see the intricacy of design and technique in a piece of art; others see the emotion and poignancy in the story told by that piece. By slowing down and really taking time to view a work, we can deliberate on art in a meditative style, exploring its depth and meaning, and can understand better its craftsmanship. On Saturday, April 27, the Freer and Sackler Galleries will take part in the rapidly growing Slow Art Day movement. We, along with more than 250 other art venues across the globe, will lead a group in looking at art objects. Then, we will discuss what we’ve discovered over lunch. It’s an opportunity to see and think deeply, and to share with each other the meaning of art in our lives. Want to learn more about Slow Art Day? Check out this interview with founder Phil Terry on the Smithsonian American Art Museum’s blog, Eye Level. Next Post Next Post: Charles Lang Freer: A Wild and Crazy Guy?